Jess Curtis/Gravity premiere a new work dealing with issues of virtuosity, ability, and disability with an international cast of disabled and non-disabled performers. … In a tiny cabaret called the Lost and Found on the outskirts of everywhere an odd group of characters drag themselves in out of the cold. From the stage, normality flies over the band and out the window, while the denizens of the dingy bar risk revealing themselves to each other. See also Frank Chan's photo documentation on Flickr, of Under the Radar at CounterPULSE in San Francisco. Matthias Herrmann studied cello with Rudolf Mandalka at the Robert Schumann Hochschule, Düsseldorf, Germany. He has created numerous award-winning scores for the productions of international dance theater companies including Do Theater (St. Petersburg, Russia), Fabrik Company (Potsdam, Germany), Howard Katz (Berlin/New York) and Jess Curtis/Gravity (San Francisco/Berlin). As a founding member of PostHolocaustPop, a collaborative Art-Band with Howard Katz and Ansgar Tappert, he is touring internationally and has released numerous CDs. Most recently he created soundscapes for video-installations, music for short film, and also composed the score for a theatrical reading of the LiteraturWERKstatt Berlin in 2004. He is also involved in other artistic collaborations with Paul Beiersdorf, Stephanie Maher and Kathleen Hermesdorf, FormVollEndeT, Mangrove Kipling, and various musical formations, among others Die Krassnajas and MoarkoVentent. Ulrike Bodammer (Berlin, Germany) graduated in 2002 from L’Ecole Superieure des Arts du Cirque in Brussels where she specialized in partner acrobatics. She has worked with the Belgian nouveau cirque company Feria Musika, Wire Monkey Dance Company, from Massachusetts, and has performed her own work at venues such as the "Half Machine Festival" in Copenhagen. She is also a Reiki master and teacher. Claire Cunningham studied music at York University and University College Dublin, specialising in vocal performance and graduating in 1999. She studied voice at the Leinster School of Music and at the Royal Scottish Academy of Music and Drama. She has worked professionally as a singer since 1999, particularly in the field of music theatre, touring throughout Scotland, including a critically acclaimed week long run at the Edinburgh Fringe Festival and performing by invitation in Romania, Germany and Ireland. In 2004 Claire started aerial training– her particular interest in this field stems from a desire to utilise the upper body strength created by having used crutches for the last 14 years, and also to investigate her ability for free movement when uninhibited by the disabling factor of weightbearing. This background led to her involvement in 2005 with Blue Eyed Soul Dance Company, England and inclusion in Jess Curtis’ recent works for the company- ‘Touch/Don’t touch’ and ‘Catch’ – performing in Trafalgar Square and Sadlers Wells, London respectively. Her work with Jess prompted a fascination for movement work which Claire is now pursuing avidly and has included recent training with Bill Shannon aka The ‘Crutchmaster’ the unique urban dancer and media artist. With dancer Linda Payne she recently formed Waterbaby – a creative partnership seeking to combine live music/vocals with dance. Their latest work ‘4 Legged Friend’ by choreographer Kally Lloyd-Jones premiered in September 2005 at Tel Aviv Opera House, Israel. Claire recently received a Creative Scotland Award – a high profile grant awarded to Scotland’s most established and prestigious artists –to gain development time for the creation of her own performance style and crutch redesign. Kaz Langley is a Disabled Dance and Performance Artist and Activist who has worked extensively in the British contemporary dance and physical theatre scene. Working as a performer, filmmaker, teacher, and consultant she has developed a reputation for depth, intelligence and physical courage in her work. Her collaborative credits include roles in productions of Graeae Theater Company (‘Mother Courage and Her Children,’ ‘And Seven’), Blue Eyed Soul Dance Company (‘Frankenstein’, directed by Liam Steel, 2002), CandoCo Contemporary Dance Company (as dancer and tutor) and with independent choreographers including Charlotte Darbyshire (Taut, 2001) and Sophia Lycouris (Homezone, 2001.) Her work has also been screened on Channel 4’s Dance 4 Camera. More recently she has been choreographing/performing and co-editing two dance films in collaboration with Steve Munro. Kaz is currently working for ShowHow Theatre Company on the production of a Forum Theatre piece, aimed at raising awareness of the experiences of employment for Black, Asian, Chinese and Disabled Performers. The work is scheduled to tour Britain at the beginning of 2005. 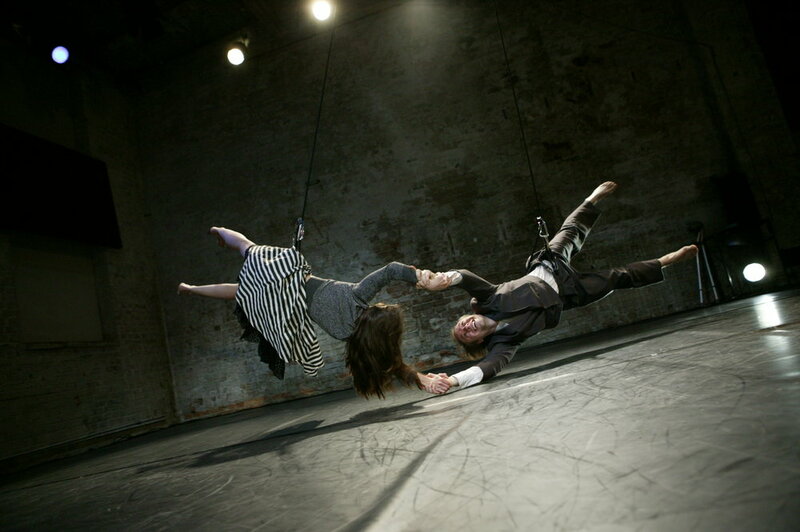 In fall 2004 Kaz began collaborating with American choreographer/director Jess Curtis on "Touched: Symptoms of Being Human," a full evening dance theatre work commissioned by Yerba Buena Center for the Arts in San Francisco and co-presented by Dock 11 in Berlin, Germany and the San Francisco International Arts Festival. The work premiered in June 2005 at Yerba Buena Center and will tour internationally through 2007. In addition to her work onstage Kaz is active in the advancement of rights and autonomy strategies for disabled persons. Since 2001 she has been a Regional Mentor for the Leonard Cheshire Disabled People’s Forum, assisting and consulting disabled people living in residential homes or who are accessing Care at Home Services. She has also worked with Equality Associates, which offers Disability Equality and Anti-Discrimination Training, Personal Assistant Schemes, Consultancy, Access and Needs Assessment, Autonomy and Personal Development, and Movement Workshops. Kaz has taught Dance, Composition, and Equality Awareness extensively throughout Britain with CandoCo, Blue Eyed Soul, and ShareMusic, as well as teaching as an independent consultant. Jörg Müller works with tubes. He graduated in 1994 from the Centre National des Arts du Cirque in Châlons en Champagne, France. While there he created "les tubes" (1993) with Mads Rosenbeck and the year after "les tubes – (mobile)" a movement/manipulation work utilizing suspended resonant tubes. In 2001 he created his latest tube work "c/o" a 25-minute performance in a 9 ft. tall glass tube filled with water. 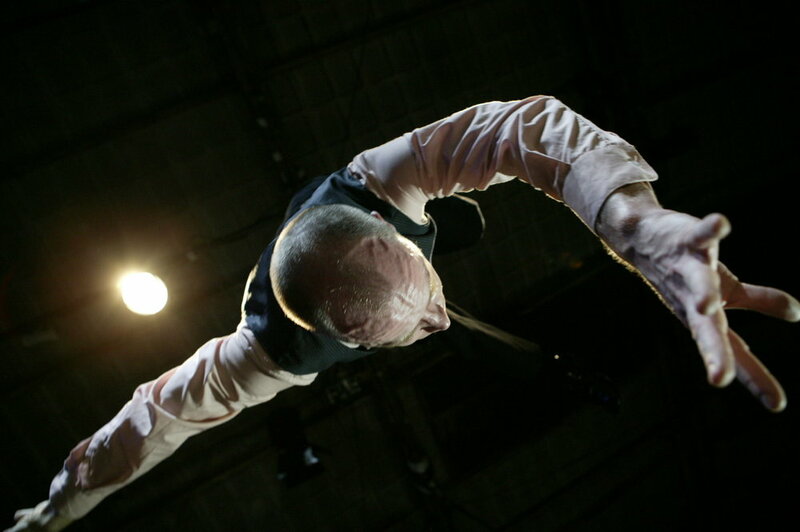 As a circus artist he has toured extensively with Cirque Plume in "Toiles II" (1995), Compagnie Cahin-Caha in "chiencrU" (2000–2002) and "Arbeit – Hinz et Kunz" (2001) with Nikolaus Holz and Christian Lucas. His path has equally included work with a number of choreographers. Notably in the works of Kitsou Dubois "Gravity Zero" (1996) and "Trajectoire Fluide" (2000–2003); Francois Verret, "Memento" (1997); Haim Adri "Anamnese Acte II" (2003-2004); Julie Nioche "les sisyphe x 10" (2005) and above all with Mark Tompkins in an extended residency in Strausbourg from 1999–2000 where in addition to participation in the creation of two full-evening works "La vie rêvée d'Aimé" (1999) and "Remixamor" (2000), he was initiated into the practices of "instantaneous composition" and contact improvisation. In 2002 he began training in the Feldenkrais technique. Maria Francesca Scaroni (Brescia, Italy) studied modern jazz, contemporary dance, and contact improvisation with teachers such as Daniel Tinazzi, David Zambrano, Andrew Harwood, and Daniel Lepkoff. She has been a member of the company Manuela Bondavalli Danza and danced in television productions for Canale 5 and Rai 3 in Italy. She is currently enjoying cross training with Aikido and Tango. Interview with Jess Curtis on KQED's SPARK. "...wonder and beauty that we don't want to take our eyes off of." "...freshly inventive, fun, and lovely to behold." "I laughed. I cried. It was better than CATS."